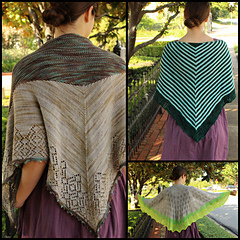 All three patterns in the Looking Back Series are now available for you to enjoy in e-book format! At first glance, these three designs might seem like an odd grouping. But not so! They are all tied together by a common thread--the pursuit of wellness, health and life, as realized through history. Long ago, when collective knowledge about healing was steeped in superstition and lore, many relied on little more than herbs, spells and Old Magic to heal the sick. As time marched on, potions and powders were peddled, purported to improve health in all sorts of ways. These snake oil salesmen, these Charlatans, offered hope with their wares, but their claims were ultimately a ruse. Until the advent of modern medicine, little could be done for the sick above rest and attentive care. But the necessity of a better way to treat the those who were ill drove some to science, to the study of pathogens and their treatments. As they say, necessity is the Mother of Invention. And modern medicine has given rise to vaccines, antibiotics and all manner of other “miracles” to treat the body. What glorious discoveries might the future hold?